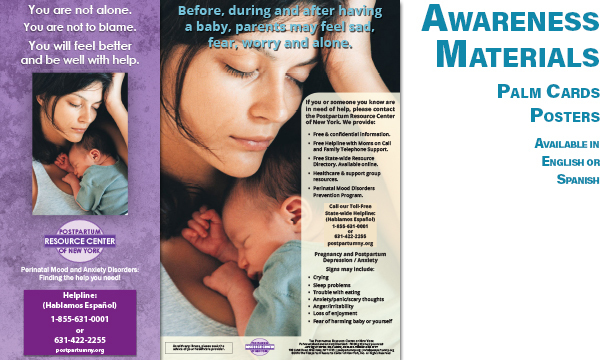 It’s been nineteen years since the Postpartum Resource Center of New York first started helping New York State moms, dads, and families at risk for or experiencing a perinatal mood and anxiety disorder, get to the help they need. Thanks to your involvement and support, we have been able to help hundreds of thousands of New York families over the course of this nearly twenty-year period. With each new year we have rededicated ourselves not only to our Mission but also to how we approach achieving our Mission. In other words, we always seeks ways that will enable us to better serve New York State moms, dads, families, and communities. So, we want to take a moment now to give you an update with the latest news and information that show how the Resource Center is accomplishing its Mission — whether through advocacy, leading and/or participating in events and trainings, making our resources materials better and more accessible than ever, moms sharing their stories of hope and healing, or through the latest developments with our Visionary program, Project 62. Please remember that you make this Mission possible. On behalf of the Postpartum Resource Center of New York as well as the moms, dads and families, and communities that we serve throughout the State, let me say thank you to all of you — thank you for caring and for helping to make a positive difference. 2nd annual Congressional Briefing and Advocacy Day. Congressional Briefing on Maternal Mental Health on Capitol Hill. Advocacy Day: Meetings with Congressional offices on Capitol Hill to educate them on constituent level issues on maternal mental health and to ask for full funding of “Bringing Postpartum Depression Out of the Shadows Act of 2015” for FY 2018-2022. Details [room block, agenda] and registration will be posted by mid February. There has been quite a bit of important news that has come out in the past few months and below you will find some of the highlights. Association of peripartum synthetic oxytocin administration and depressive and anxiety disorders within the first postpartum year. This new study by the National Center for Biotechnology Information was just published on February 1, 2017. To view the study, please go here. The Neurobiology of Postpartum Anxiety and Depression. This important study, which was just a published at the end of January in Trends in Neurosciences and featured in an article by Medical xPress, suggests that postpartum depression and anxiety is distinct from other mood disorders. To reach the study, please click here. Another important post that was published in early January was written by Dr. Jack Levine, Postpartum Resource Center of New York Advisory Board member. The subject of the article was Screening for Postpartum Depression and Anxiety: A Perfect Pediatric Opportunity! You can find blog post here at the AAP New York Chapter 2 website. Latest progress in maternal mental health – A new consensus bundle aims to help healthcare providers implement evidence-based guidelines for the diagnosis and management of perinatal maternal mental health conditions. “The bundle seeks to provide a framework to assist providers, regardless of clinical setting, in developing a consistent approach to screening for perinatal mood and anxiety disorders and developing brief interventions as well as strategies for referral, response to emergent situations, and follow-up to ensure continuity of care,” said lead author Susan Kendig, JD, MSN, from the National Association of Nurse Practitioners in Women’s Health, Washington, DC. Lastly, there is a new Research Study called the Hummingbird Study. The purpose of this study is to evaluate the safety and effectiveness of an investigational medication in women with moderate to severe postpartum depression. To see more perinatal mood and anxiety disorder news at our website, click here. Project 62 is the Vision of the Postpartum Resource Center of New York. By offering prevention programs, screening and awareness campaigns, education and trainings, Circle of Caring pregnancy and postpartum depression/anxiety support groups and collaborations to increase treatment and support services, together we are better able to help save lives and build healthy families for vibrant New York communities now and for future generations. In order to achieve the goal of Project 62, we are setting up perinatal mood and anxiety disorder Task Forces in all sixty-two New York State counties.Currently, we have Task Forces established or forming in the following counties: Allegany, Cattaraugus, Chautauqua, Erie, Genesee, Niagara, Orleans and Wyoming (comprising the WNY PMAD Task Force), Monroe County, Onondaga County, Suffolk County (Team Leader: Long Island Doula Association), Albany, Rensselaer, Saratoga, Schenectady, Warren, and Washington counties (Team Leader: Shades of Light). December 7, 2017Kim Zittel-Barr, Ph.D., LMSW, ACSW, Social Work Department Chair and Associate Professor at Buffalo State College, is the Western New York PMAD Task Force Team Leader and Postpartum Resource Center of New York’s Western New York PMAD Task Force Director.If you want to become involved in the WNY PMAD Task Force, please complete the contact form here. Awareness materials are a vital component of our efforts to educate the public about the number one medical complication of pregnancy. They help increase awareness and getting families to the help they need. On November 1st and 8th, we held our Circle of Caring Pregnancy and Postpartum Depression/Anxiety Support Group Program ~ Advanced Facilitator Training. These popular trainings (which were also held just three months earlier in August) are part of The Postpartum Resource Center of New York’s Training Institute, and which we are able to offer thanks to your support. The trainings were conducted by Executive Director, Sonia Murdock, and were for the community agencies/health centers and supporters who are interested in offering the Postpartum Resource Center of New York’s Circle of Caring Pregnancy and Postpartum Depression Support Groups. Members of EOC of Nassau County, Inc. were trained in the Circle of Caring program and have since started their own Circle of Caring program at their offices in Hempstead, New York. 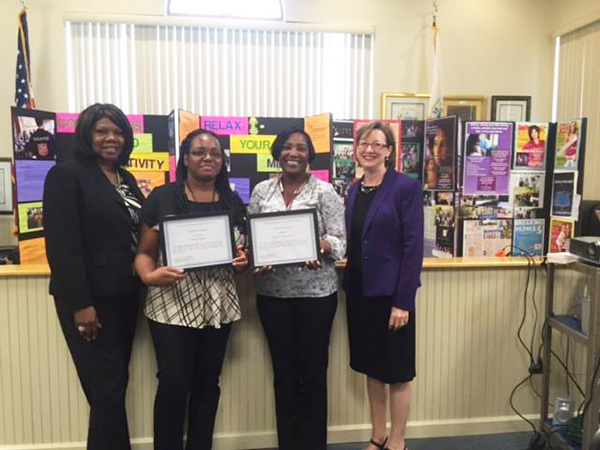 A photo of members from EOC of Nassau County/Maternal & Infant Community Health Collaborative (MICHC) can be seen below. It includes: MelRose Corley- Program Director, Miriam Milord – Program Coordinator, Beatrice Goodman – Community Health Worker Supervisor and PRC of NY Executive Director, Sonia Murdock. Good Samaritan Hospital Medical Center’s Mother’s Circle of Hope program. 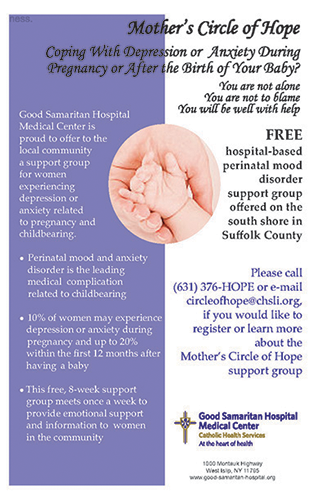 This program was started after members of Good Samaritan Hospital Medical Center, West Islip, New York, were trained by the Postpartum Resource of New York. They have made a commitment to continued education for new support group facilitators. The flyer for their program can be seen below. These trainings are an important component of Project 62. For more information about our Circle of Caring trainings, please contact us here. One of the most visited parts of our website is the section on personal stories of hope and healing written by moms. Julie Ende, Carol Harnist and Carolina Zaharako are the latest moms to add their stories. You can read their encouraging stories as well as those of a number of other moms by clicking here to reach the Sharing Our Stories page at our website. Postpartum Support International’s Perinatal Mood Disorders: Components of Care Certificate of Completion Course at Buffalo State College on May 17-18, 2017. This event is presented by the Postpartum Resource Center of New York’s PMAD WNY Task Force in collaboration with Buffalo State College. The 2-day PSI Certificate of Completion Course, taught by experienced and engaging faculty, is a thorough and evidence-based curriculum designed for nurses, physicians, social workers, mental health providers, childbirth professionals, social support providers, or anyone interested in learning skills and knowledge for assessment and treatment of perinatal mood disorders. Registration includes training binder, handouts, breakfast and lunch, and continuing education credits. On Friday, November 11, 2016, we held our 3rd Annual Lisa Mary Reilly Visioning Educational Series event. This year it was our honor to host as our special guest speaker, Jane I. Honikman, MS. Jane, one of the true visionary leaders in the field of perinatal mood and anxiety disorders and parent support, is the Co-founder of the Postpartum Action Institute, located in Santa Barbara, California, and she is also the Founder of Postpartum Support International as well as the author of the books Community Support for New Families and Postpartum Action Manual. The purpose of this series as conceived by Lisa Mary Reilly, is for small groups to come together over a meal to share, inspire, motivate and make a difference in the community for families. To reach the archived event page, please go here. 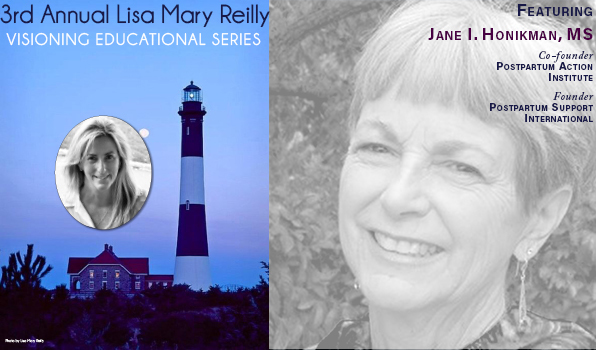 The Lisa Mary Reilly Visioning Educational Series is part of our Project 62 — Building and Strengthening Perinatal Mental Health Parent Support Networks and Safety Nets in all Sixty-two New York State counties. This year’s event was held in the Vanderbilt Suites at the MetLife Building in New York City. We are grateful to Sounds of Silence, Friends of the Postpartum Resource Center of New York, for sponsoring this annual event. The February issue of the Postpartum Resource Center of New York’s FREE State-wide PMAD Resource Directory is now available. We update the Directory each month and this edition contains new listings as well as updates throughout. Some of the important features of the Directory are listed below. + Online Directory is searchable by zip code, as well as city, town, or county. + Searchable on Desktop, Tablet or Mobile Device. + Available 24/7 and as a downloadable pdf. Registration is open and Sponsorships are available for the 9th Annual Sounds of Silence 5k Run for Pregnancy and Postpartum Depression Awareness. The event will take place on Saturday, April 29, 2017 at Jones Beach State Park in Wantagh, New York. Last year we had over 550 runners, walkers, and stroller-walkers and this year we are expecting even greater participation. We will, of course, also have our popular Kid’s Fun Run after the 5k race. + Top fundraiser (Individual & Team). + Commemorative T-shirts for first (250) entrants. + Pre and Post-race refreshments & snacks. + Race swag bag to first 500 registrants. + Post Race Raffle: Designer Products, gift certificates, gift baskets and more**. If you are not able to make it to Jones Beach, you can still participate and make a difference by registering as a Virtual Runner! All proceeds benefit the Postpartum Resource Center of New York. Thanks to Erin Mascaro, Fundraising Chair / Event Director, Patricia Beaumont, Event Co-Chair as well as the Sounds of Silence committee members for organizing this important annual event! 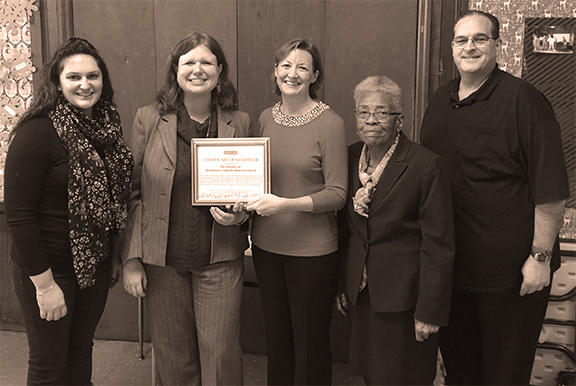 The Postpartum Resource Center of New York recently expressed its gratitude to the members of Westminster United Presbyterian Church, West Islip, New York at their Annual Meeting for supporting the mission of the Postpartum Resource Center of New York so mothers, fathers and families in need of support for parental mental health get the help they need. PRC of NY Volunteer Jill Olish shared at the meeting Why I Care”. Since 2000, the member of Westminster United Presbyterian Church have generously supported the Postpartum Resource Center of New York as a church mission project. They provide space where PRC of NY is headquartered and support the organizations’ mission and vision with volunteering and fundraising. We have an active presence on social media – particularly with Facebook and Twitter. You can keep up with the latest news from the Postpartum Resource Center of New York plus help spread awareness by liking or following us.